This manual will guide you on every detail about how to install and use the Billing for FusionPBX native application. If you want to have a quick setup, you may read the quick guide and later return here. You need to have FusionPBX 3.6 or better installed with MySQL, MariaDB or PostgreSQL as database data storage. If you don't know how to do this, OKay offers Linux consultant services. You need to have LCR for FusionPBX installed. You need to download and get a Billing for FusionPBX license. Go into /var/www/html/app/billing directory and execute echo -n key > any_name.key command, where key is your license number. Since version 1.0.1 license name can have any name with .key extension. Copy niblebill.conf.xml into autoload_configs directory (for example: /etc/freeswitch/autoload_configs/).cp niblebill.conf.xml /etc/freeswitch/autoload_configs/. Edit niblebill.conf.xml file and change the DSN values with yours. Log into FusionPBX as superadmin and go to System->Modules menu, enable and start Niblebill module. A Profile is used to define a billing. Each profile is identified by a unique label. A Billing Cycle defines the billing day. Static charges will take place this day. A billing type may be pre or post paid. The specific amount, on post-paid profiles it establishes the maximum credit a profile may have. This value is zero for pre-paid profiles. You must define billing currency, the system will use external services to do the rating. LCR profile is a pricing list. By changing this label, you may have more than one pricing list. Referal fields let you reward your users just because they recommend your service. Select FROM and TO depending who shall send the billing to who. Data will be taken according to information in Contacts application; you can go to App -> Contacts menu to fill information. In most cases, using billing per tenant is enough, but there are specific cases where an alternate code is required, especially if you need more than one billing profile per tenant; in this case, select the by-code option. The value entered in the Criteria Value field needs to be in place on all other FusionPBX items. 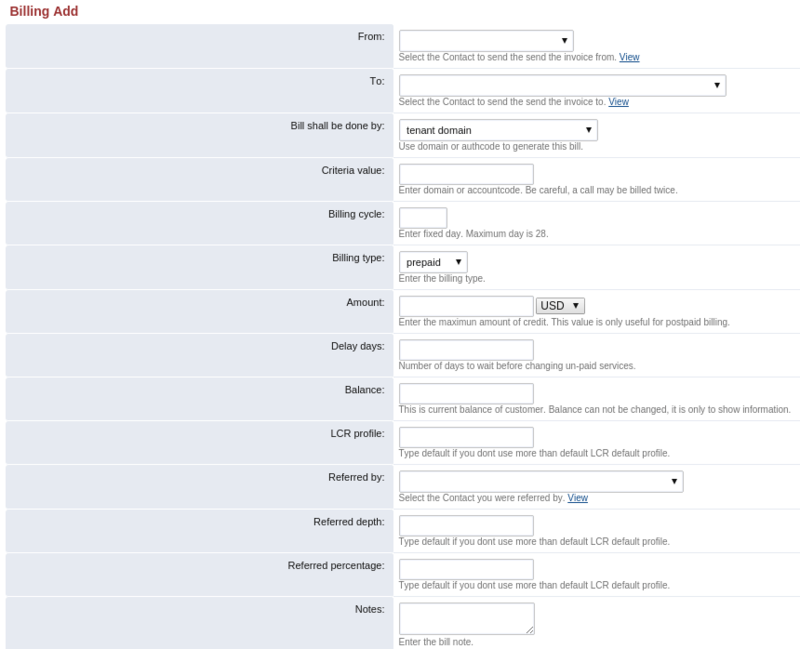 Select the billing day cycle, to make things simple it is only allowed from 1 to 28. The Amount field is read-only, you must select the currency for billing. Once the currency is set, you won't be able to change it. Delay days field is not used. Balance is a read-only field. LCR profile field will tell the profile what pricing list to use. By default it is 'default', by adding a new profile means to modify file lcr.conf.xml. Referal fields are sued to reward your users because of recommendations. Remember to fill the accountcode field with correct value when creating items in FusionPBX.